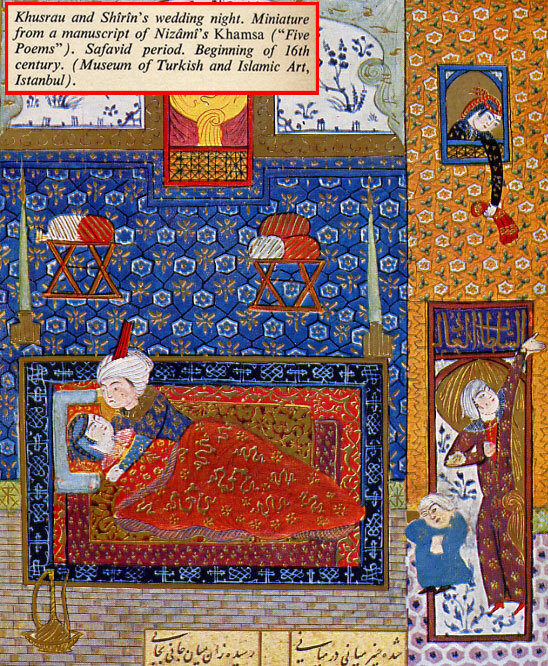 This Folio is about Khosrow and Shirin's wedding night. 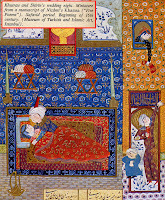 The miniature is from a manuscript of Nizami's Khamsa (Five Poems). Niẓām ad-Dīn Abū Muḥammad Ilyās ibn-Yūsuf ibn-Zakkī, was a 12th-century Persian poet. Nizāmi is considered the greatest romantic epic poet in Persian literature,  who brought a colloquial and realistic style to the Persian epic.